Paisley Dalmatians. Puppy information and pictures. 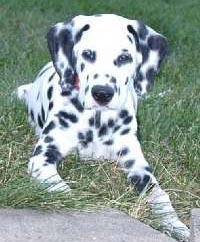 If you're thinking about buying a Dalmatian puppy, please check out these pages. 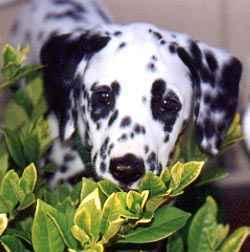 Choices - Is the Dalmatian the right breed for you? Decisions - Male or Female? Black or Liver? Pet or Show? Bi or Uni? IF you are thinking of adding a Dal to your family, we'll gladly answer your questions concerning the breed. If your kids are affected with Dalmania, please remember that a dog is not a disposable commodity and should never be purchased on a whim. Research the breeds, talk to the breeders, meet the dogs and choose the right breed for your circumstances, or perhaps no dog at all. If your life is already too busy, a pup will only make things more chaotic. Dogs are a great deal of work and responsibility, and it takes a lot of time to raise a puppy properly. Be sure you have the time to raise a puppy correctly and never add a pup unless you plan to be responsible for its care for the next 12 - 15 years! There have been very few Dal pups available in recent years, so plan to reserve a pup from a responsible breeder. You may have to wait awhile, but a quality pup will be worth the wait. Be careful who you deal with, and choose an experienced breeder who knows the breed, rather than someone who is out to make a fast buck on a litter of pups. Take the time to do additional research and to be absolutely certain that a Dal is an appropriate addition to your family. If you don't want to go through all the work of raising a pup, perhaps an adult or a rescue dog would be the best choice for you, but remember that Dals are a "needy" breed and require lots of time and attention if they are to be happy, well-adjusted dogs. 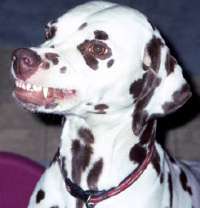 Why Is This Dog Smiling? Coral Ch. Paisley Snowood Family Ties (L) is smiling because Sue is FINALLY updating her website! Coral is also smiling because there may be a new litter at Paisley this year and SHE is not the mother. Coral is now retired from motherhood but is always available to puppysit her grandkids - or supply a little discipline if necessary!